The Ionosphere is a single person lightweight bivi tent manufactured by Snugpak; a UK company based in Silsden in Yorkshire. The tent seems to be aimed at lightweight campers who are prepared to compromise internal space, particularly height, in order to save weight and packed bulk. It is primarily marketed to military personnel or for outdoor professionals looking to carry a robust emergency shelter. 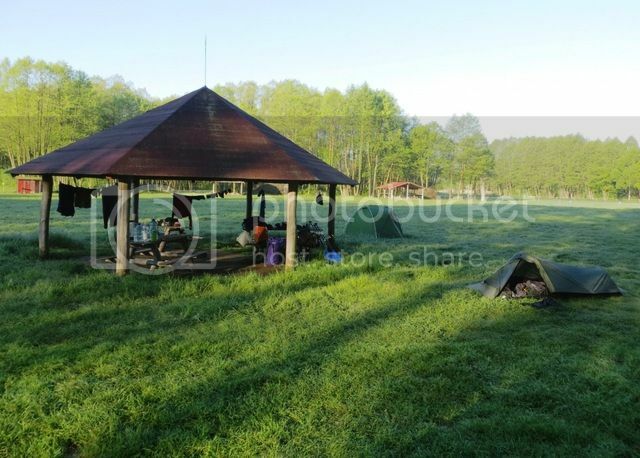 The tent was reviewed during my five-day paddling trip on the River Obra in Poland during May 2016. During the trip, the weather was fair throughout with temperatures regularly exceeding 25o C. This tent was chosen for the trip in order to save space and weight in hold baggage on the outbound and return flights. 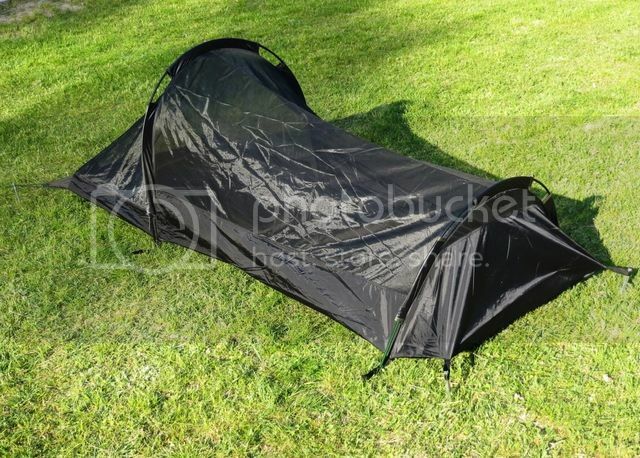 The tent has an RRP of £150 however, it can be purchased for as little as £112 (www. polimil.co.uk retail the tent for £124, with free postage, and offer a 10% discount on your first purchase if you sign up for their newsletter). The tent comes delivered in a printed cardboard box. Inside, the tent is packaged in its stuff sac. The stuff sac was the first thing I was impressed by. This is no flimsy, readily damaged, draw-string bag but, rather a robust, roll-top green drybag with taped seams. 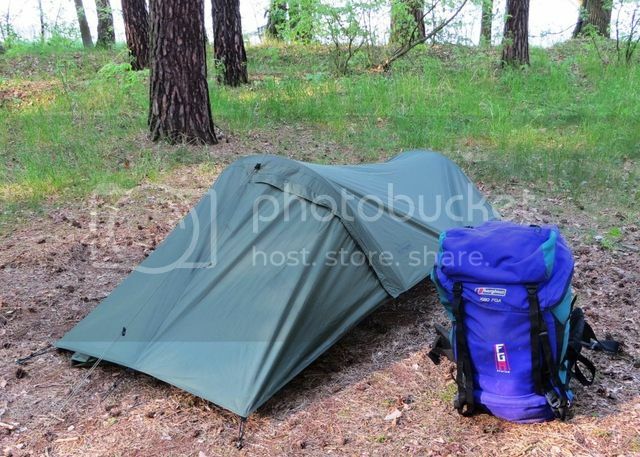 The tent is remarkably compact and could easily be strapped onto the side of a day pack. It weighs a very modest 1.52 kg with all parts present. 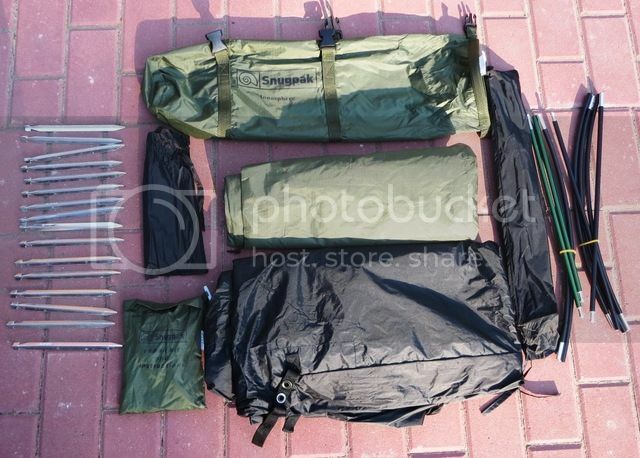 Snugpak claim a ‘trail weight’ of 1.2 kg if you take only the inner, poles and fly but, why you’d want to leave behind the pegs and guys is genuinely a mystery to me. On first opening the tent out, I was particularly impressed with the design of the pegs. These were of the very strong three pronged design and astonishingly light. When it came to putting them into the ground, ‘heeling’ them in worked fine, even in firm ground and I found that by holding a spare peg and hooking this into the top of a peg in the ground, gave me all the purchase I needed to pull the pegs back out. During the trip, not a single peg bent, even though the ground was on occasion quite firm. The Ionosphere also came with a comprehensive repair kit. A patch of each different material used in the tent’s construction was included along with a spare guy loop and a sleeve that can be used to temporarily fix a broken pole. Within the repair kit, a small card is included that provides instructions with clear diagrams on how to erect the tent. 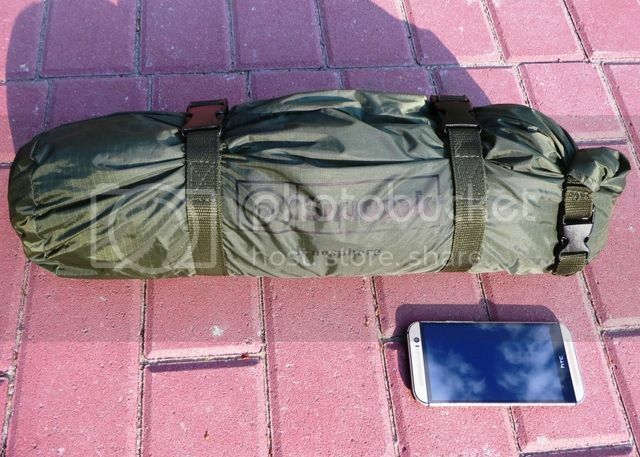 The first thing to note is that the Ionosphere is a proper tent, not simply a single layer drippy bivi bag with a hoop to keep the bag clear of your face. It has a separate inner and outer, with two poles, a smaller one at your toes and a larger hoop at the level of your shoulders. The tent inner is made of ‘no-see-um’ mosquito netting that is soft to the touch and is fully stitched into the waterproof groundsheet tray that has a claimed hydrostatic head of 5,000 mm. I found that the design of the tent inner using transparent black mosquito netting helped maximize ventilation. This was important during the warm weather I experienced on my trip, in for what is still quite a confined internal space. This also helped reduce any feeling of claustrophobia that can be a problem in some other small tents. 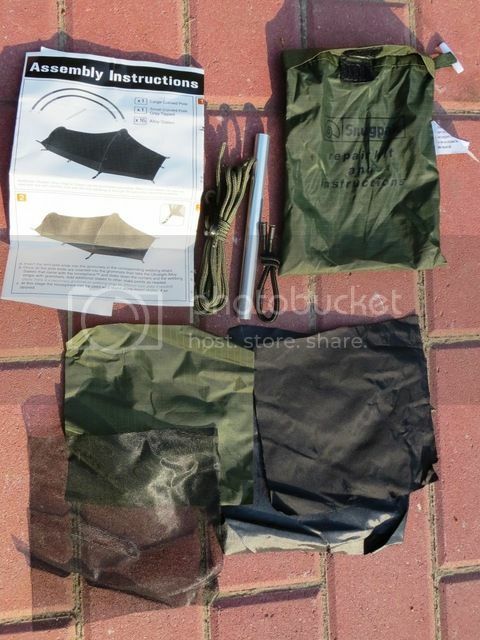 The tent inner comes with two small pockets, one either side at about waist level. These are handy for keeping small items off the tent floor, such as watches or glasses. The tent comes with a single door at the front, on the right hand side as you lie on your back. The door in the inner closes with two zips, one vertical and one horizontal that meet in a small nylon fabric gusset that helps seal the zip junction to any unwanted bugs. The door in the outer is a single vertical zip running up to the highest point of the tent, which is covered by a tight storm flap when the zip is closed. I found the zips on the inner very easy to use but, as is often the case with tent zips, the zip on the outer was a bit fiddly to close without catching on the fabric. Both the inner and the outer flysheet have tie-back loops for holding the door open. 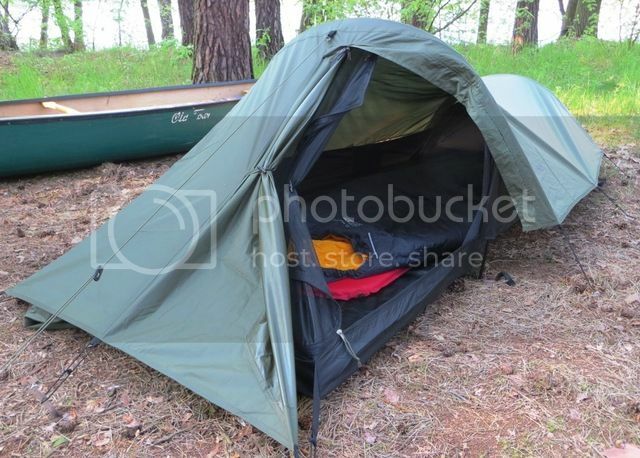 The tent outer is made from PU coated ripstop nylon with a claimed hydrostatic head of 5,000 mm. Whilst some tents use a heavier weight material offering greater waterproofing, this seems fully sufficient given the tent’s shape which readily sheds water and offers no opportunities for ‘ponding’. 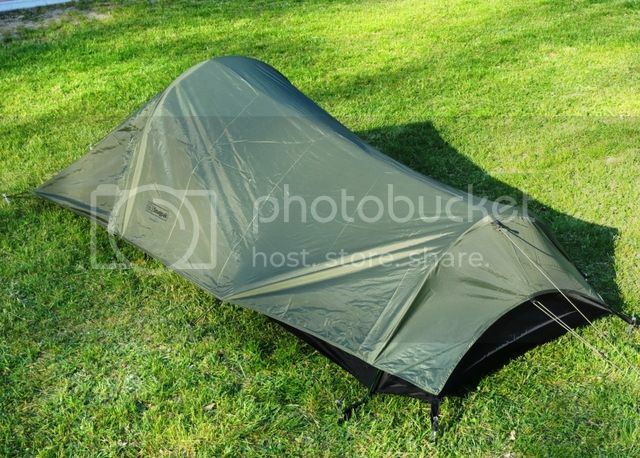 The tent comes in only one colour option – dark green – that is well suited to those, like myself, who are seeking to blend into the countryside rather than make a fashion statement. In terms of dimensions, the Ionospere’s tent inner is 240 cm long, 90 cm wide, 70 cm high at the shoulder level and 40 cm high at your toes. Even though I’m just shy of 6 ft tall, this was actually surprisingly spacious and not at all like sleeping in a bivi bag. As the tent is only 70 cm high, you are meant to enter feet-first, but I was able to go in head first and, with a bit of a squeeze, get myself turned round. In terms of height, I was not able to sit up fully, so getting dressed or undressed inside is something that needs to be done on the horizontal. Once the tent outer is on, the overall footprint increases to 265 cm long by 100 cm wide. The Ionosphere therefore has a very small footprint that meant that I found it pretty easy to find a flattish and smooth area where it’d fit. Overall, I think the design is simple and effective. The materials all seem to be of good quality and the build quality seems sound. For the money, I was impressed that no corners seemed to have been cut. Of all the many tents I’ve owned and used in over 30 years of camping, I can genuinely say that the Ionosphere is probably the easiest and most intuitive tent to pitch I’ve ever used. On laying out the inner, I found that 4 pegs was all I needed at this stage. By assembling the lightweight sprung aluminium poles you’ll find that one is shorter than the other. Feed the short pole through the sleeves at the foot end and then slot the pole ends into the metal eyelets. Repeat for the large pole at the front. Then peg out the front of the tent, drawing the whole inner upright and tight. The poles and sleeves are colour coded but, being colour-blind, I found that the considerable difference in length of the two poles made identifying which was which very easy. The next step is to attach the outer flysheet to the poles. This is done with two small Velcro straps on each pole. Then simply pull the flysheet out and peg it down using the elasticated loops around its edge. The flysheet sits approximately 10cm clear of the ground. I assume this is to help maximise airflow into the tent inner to improve ventilation. Finally, there are two string guy ropes, one at the head end and one at the toe end that keep the poles upright and the flysheet taught. All up, it took about five minutes from start to finish to erect the Ionosphere. Two minor issues become apparent during first pitching. The first is that the Ionosphere pitches ‘inner first’, which, is not ideal if it is pouring with rain. Another criticism was that the pole sleeves on the inner are made of three separate sleeves in order to allow two sections of pole to be clear for the Velcro straps on the fly sheet to be attached. This made inserting the poles a little more fiddly as the poles had to be fed through each sleeve section in turn but, to be fair, this was only a very minor frustration. I liked the Ionosphere. I liked it a lot. Once I accepted that this is not a base-camp tent with lots of space to sit up and administrate myself, it was a very easy tent to live with. In terms of internal space, it was much better than anticipated. 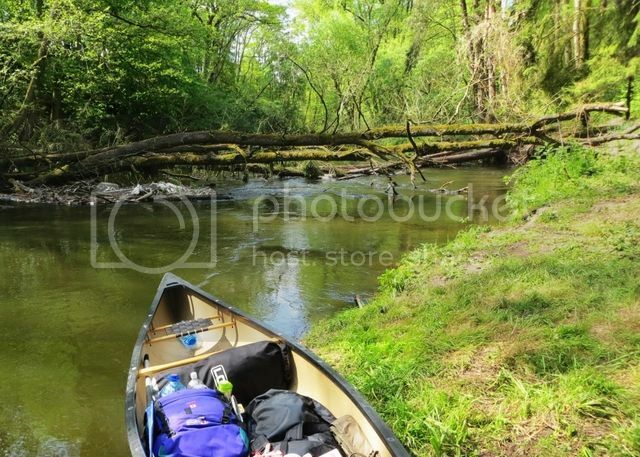 At 240 cm long, there was plenty of internal space for me to lie out fully stretched with enough space remaining at the head end for a large daypack to be stored inside. One small thing that could have made it even better would have been the inclusion of a small hanging loop at the apex of the large hoop at shoulder level. If this had been present, I could have clipped a torch of small tent light onto it. This is something that I’ll probably retro-fit myself as it would improve the usability of the Ionospehere. Overall, I think Snugpak have done a fantastic job with the Ionosphere. It meets its headline objectives of being very light and packing really small. The design and build quality are good, maximising the internal space, ventilation and resilience to weather. 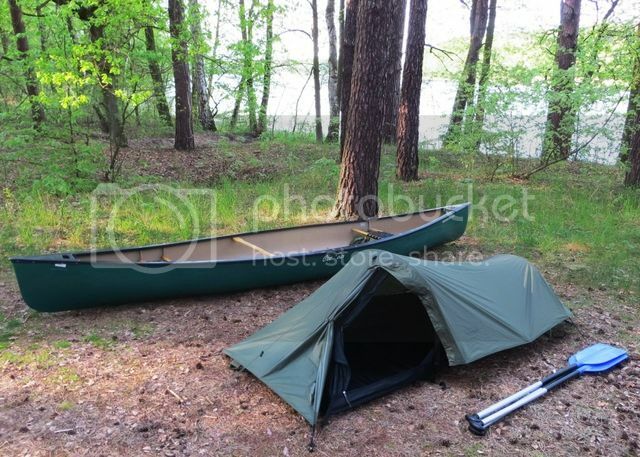 For the money, I think the Ionospere is genuinely a bit of a bargain and it will be a tent that features regularly on my future packing list, irrespective of whether I’m flying or not.